It is time to decorate your windows for the holidays! Decorate them with these festive Candy Cane Clings. Don't they look good enough to eat? 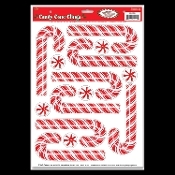 Each sheet includes eight traditional looking candy canes and six round peppermints. Peppermint candy clings are all quality printed in the traditional red and white color striped design. Candy Cane Clings are removable, and will adhere to most smooth, clean surfaces like glass windows, appliances or mirrors without any tape or adhesives.